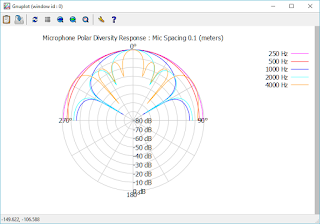 set title "Microphone Polar Diversity Response : Mic Spacing 0.1 (meters)"
"4000.dat" u (-$1+90. ):($2-f_maxGain) t "4000 Hz" w lines lc rgb "orange"
print "Hit <CR> to continue ..."
The data was generated in a C program and written to the .dat files, then I just used gnuplot on the command line to execute the script and plot the results. The gnuplot script allows the min and max gain values to be changed. Good article.Thank you for providing this informative article.I read full content and i can follow all the information provided here.This article helped me in a great extent.This is really interesting to read this.Visit best essay writing service to get more details. With small changes I'm using it for antenna pattern.